If you would like to promote your business on the Produce Plus website or in the Produce Plus Newsletter, you can apply online right here by completing the form below. For more information on our online advertising prices and banner positions, please see the online advertising rates listed below. 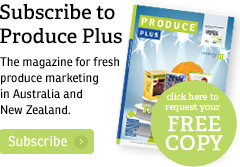 There are three good reasons to advertise in the print and digital edition of Produce Plus: each of its quarterly issues a year is seen by thousands of readers in Australia and New Zealand; Produce Plus provides the best industry analysis and in-depth company, product and marketing updates for the fast-growing fresh produce market in Australasia; and Asiafruit offers you the best platform to promote your products and services in this region.